Ceramic coaxial resonators with high Q and very good temperature stability are perfectly suitable for oscillators and as elements of filters, bandpass, bandstop (notch) and duplexers typically. 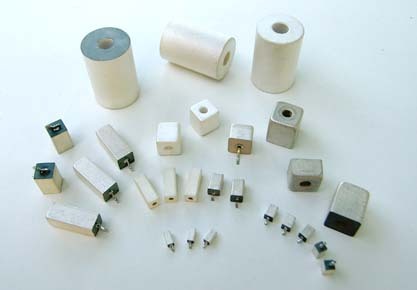 Coaxial resonators are manufactured as quarter wave or half wave and as multiresonator blocks. Silver coating ensures excellent Q, good solderability and adhesion. 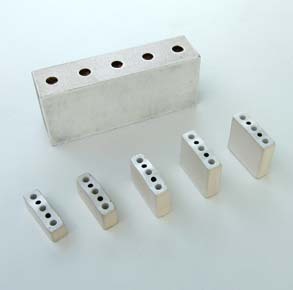 Resonators are tuned to specified frequency with a choice of tolerances and can be supplied with various types of connecting tabs or without tabs. Coaxial resonators are available over a frequency range of 400 MHz to 6 GHz with square or circular cross section and wide choice of permittivity: 11, 20 and 37. Larger resonators can provide greater Q, smaller resonators can be used at higher frequencies.